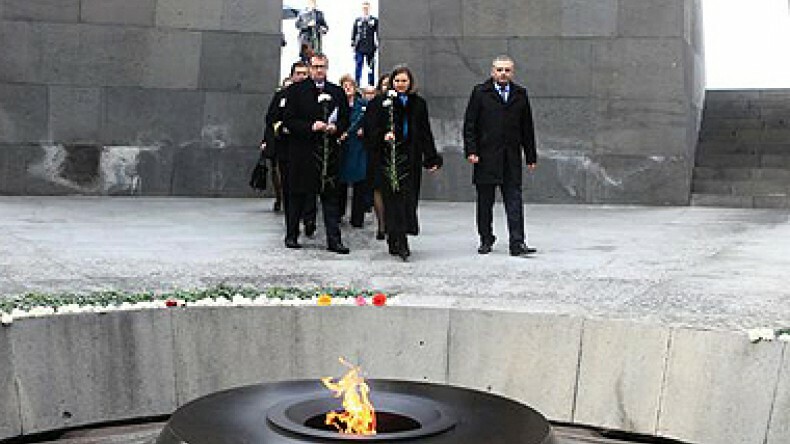 As part of her visit to Yerevan, U.S. Assistant Secretary of State for European and Eurasian Affairs Victoria Nuland visited Tsitsernakaberd Armenian Genocide Memorial Complex, the U.S. Embassy said on Twitter. Mrs Nuland arrived in Armenia today. She traveled to Baku on Monday and to Tbilisi on Tuesday. According to a press release by the U.S. Department of State, in Yerevan, she will meet with senior government officials, civil society groups, and youth representatives to discuss strengthening political, economic, and people-to-people ties with Armenia and advancing a just and lasting settlement of the Nagorno-Karabakh conflict. Nuland has already met with Armenian Foreign Minister Edward Nalbandian.